Visitors can use their mobile phones, but only within a three kilometres radius of William Creek. The intermittent Telstra phone service that has plagued parts of South Australia’s Outback for well over a week is putting people in danger, according to William Creek Hotel owner, Trevor Wright. The publican has slammed Telstra’s ‘she’ll be right’ attitude as the area, 1000 kilometres north of Adelaide, has been left without service as temperatures soar to over 4oC. Telstra confirmed to the Advertiser that 11 remote-customer sites, including the William Creek Hotel and surrounding stations, had been experiencing intermittent coverage. Under Telstra’s universal service obligation, the defined restoration times for landlines in locations such as William Creek is within three days once the fault is reported. The paper reports that Mr Wright notified Telstra over a week ago of the issue, which had also affected the pub’s EFTPOS. He said the time it had taken to fix the problem was a ‘new record’. Telstra’s regional general manager Mark Bolton apologised for any inconvenience caused to customers and hoped the service would be restored ‘as soon as possible’. 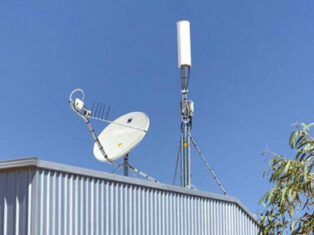 In March last year, William Creek got a small satellite dish and Optus 3G network, allowing residents and tourists to use their mobile phones but only within a three kilometres radius of the town.